Customers are the heart of your businesses. After all, they provide the revenue to keep your establishment running strong—the fuel to your engine, the peanut butter to your jelly, the milk to your mustache—too much? Jokes aside, have you given much thought to how your customers can actually contribute to helping you grow your customer base? Peer-to-peer marketing is not only a viable channel you should be exploring, but it’s also one that has seen great success in both B2B and B2C marketing. It’s all about fully partnering with your network of happy customers to assist with social selling, referrals, and thought leadership. In fact, 91% of B2B purchasers say past buying decisions had been influenced by word of mouth from industry peers. The best way to capitalize on this is by including your customer in your content marketing strategy. In this blog, I will share with you 6 ways you can begin to include customers in your content. If you visit any business website, you are likely to come across a collection of customer case studies either displayed on the homepage or collected under a dedicated tab. Case studies provide the most compelling way to share with your audience how their industry peers have overcome similar challenges with your solution in a relatable structure—a story. In fact, it’s been proven that storytelling can have a profound impact on the decisions we make. However, just like bad stories exist, bad case studies exist. A Relatable Challenge—Your audience can take many different angles, but one thing that these stories should have in common is a relatable challenge for your potential buyers. If your audience is the banking industry share how your solution has helped Bank X boost home loan cross-sells, or how Non-profit Y had converted 4x more donors into members over the past year, or how Company Z has enjoyed greater functionality and therefore improved output and ROI after migration from a competing solution. Visual Use Case—Sharing specific use cases (making sure to not get too in the weeds) helps to paint the full picture of how your customer got from A to B—and how your reader can too! It builds credibility and helps your reader visualize how they can similarly use your solution—it even may spark new use cases they can adopt with your solution. Your customer base is a rich pool of knowledge just waiting to be shared, and customer blogging is an excellent way to do that. With a variety of different industries and personas who all have something in common, your blog provides a great platform to share new ideas, perspectives, and grow a community. If you have a robust guest blogging program already in place, think about your editorial calendar and what customers may have a great piece of thought leadership to add to your blog. Remember that link-stuffing and blogs that are focused on selling your products can turn off potential buyers—even if the links that are stuffed in there are not for your own products. Consider what you learned about your buyers during the sales cycle and reach out to them to write a blog about a particular pain point that they have. You can also use this as an opportunity to reach a new audience if you ask your customer to cross-promote or republish on their own channels with an attribution link to your blog. As blogging can be a relatively low budget channel, this is an excellent opportunity to maximize your content team’s time by giving them a reprieve from having to write every blog themselves! This is also a unique opportunity to give your customers an opportunity to tell their story and build their own brand up as one that focuses on thought leadership. Similar to customer blogging, you can launch a customer webinar series. This is a neat way to feature customers as guests or even invite them to speak on topics they are well versed in. If you market to a variety of different industries, or if you have a built-out product suite, it’s a great way for your customers to share with their industry peers tricks of the trade, how they find success using your platform, or their point of view on common challenges. The great thing about webinars, differing from the previous content channels mentioned, is that your guest speaker has the time to go more in depth, show live visuals, and interact with your audience through live chat. Giving a voice to the content adds a dimension of credibility—something not easily portrayed in written content mediums. If you haven’t noticed yet, live streaming is not-so-quietly beginning to take over social media. It offers a fresh, exciting, and cost-effective way to engage with your target audience like never before. While live streaming is still a fairly new market given that many companies are still trying to fine-tune their approach, it’s certainly a craze to be a part of. In fact, so much so that spectators predict this industry to be worth over $70 billion, by 2021. But why the craze? Numbers show that 80% of customers would rather watch a live stream video than read a post from a brand—But why you ask? Just like the trill that comes along with seeing your favorite celebrity hop on Instagram live or an influencer respond to your tweet, live streaming provides a new level of trust, transparency, and authenticity. If this is something you haven’t yet explored—I encourage you to do so. And guess what? Featuring customer is a great way to get started. Think of how you can incorporate live streaming through live events, Q&As, interviews, announcements, or even behind the scene opportunities. Similar to live streaming, self-recorded video content is another cutting edge way to enrich your customer community online. 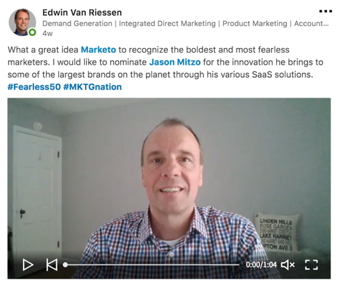 Video submissions are a new and fun approach our team has recently begun to embrace, and it’s exciting to see how our customers have responded—Check out the team below! 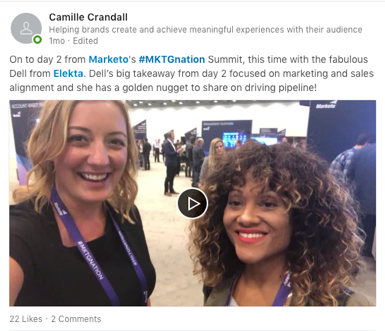 Camille Crandall, account executive at Marketo takes advantage of the Marketing Nation Summit to launch a three-day mini-interview series of impromptu videos featuring customers and their daily takeaways. This was a really fantastic way to document the event! 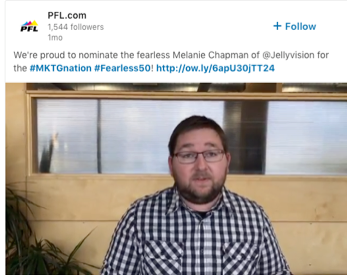 Also leading up to Summit, our customer marketing team launched the Fearless 50 nomination challenge. Our customers eagerly took to this challenge through their very own video submissions. And of course, we can’t forget the golden nuggets that enrich every piece of content our marketing team comes out with: customer quotes. The amazing thing about these pieces of treasure is that we can (and we do) include them everywhere—sales slide decks, battle cards, ebooks, white papers, social media. It’s probably the easiest and most impactful way we involve our customers in the content we produce. One of the greatest marketing challenges is deciding on what message will truly resonate with your audience—and what better way to do this than through peer-to-peer marketing. There are countless ways to include customers in your content marketing strategy, beyond the traditional case study or press release. Furthermore, with the continued adoption and development of technology we have the freedom to do what we do best and get creative, try something new: be fearless. Sound familiar? 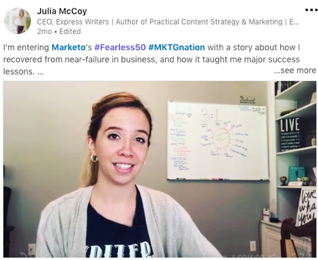 What are the most exciting ways your team involves customers in your content? Share with us in the comments below. The post 6 Ways to Include Customers in Your Content appeared first on Marketo Marketing Blog – Best Practices and Thought Leadership.